Under Alexander I. and Nicholas I. One of the Russian rationalistic bodies known under the general name of "Judaizing sects" (see Judaizing Heresy). On the whole, the Subbotniki differ but little from the other Judaizing societies. They first appeared in the reign of Catherine II., toward the end of the eighteenth century. According to the official reports of the Russian government, most of the followers of this sect practise the rite of circumcision, believe in one God, do not believe in the Trinity, accept only the Old Testament portion of the Bible, and observe the Sabbath on Saturday instead of on Sunday. According to the same source, however, some of them, as, for instance, the Subbotniki of Moscow, do not practise circumcision; moreover, they believe in Jesus, but regard him as a saint and prophet and not as the son of God. Others await the coming of the Messiah as king of the earth. Some of them revere the New Testament; others place it on a lower level than the Old Testament. However, the Russian official sources can not be trusted implicitly, since the Subbotniki, like other Judaizing sects, carefully conceal from the Christians their religious beliefs and rites. They do not act so guardedly toward the Jews; indeed, they even style themselves "Jews." 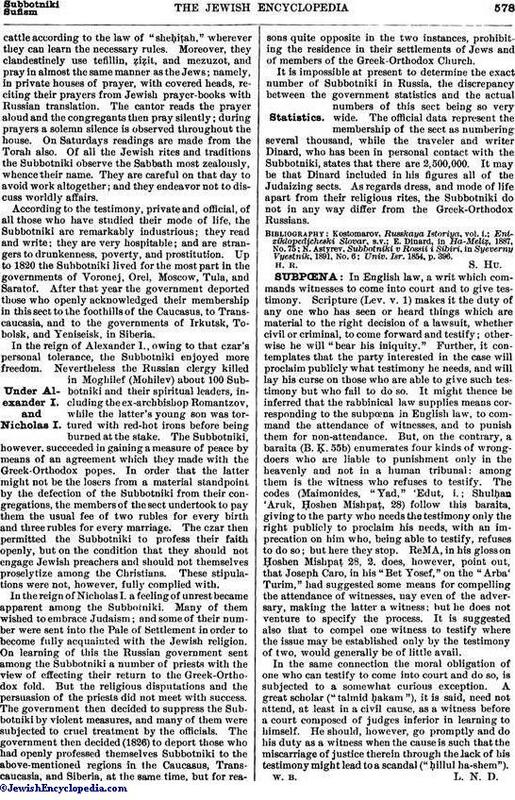 The Russian government carefully isolates the Subbotniki from the followers of either religion, but whenever the opportunity offers itself the Subbotniki apply to the Jews for Hebrew religious books. Apart from practising the rite of circumcision, they also slaughtercattle according to the law of "sheḥiṭah," wherever they can learn the necessary rules. Moreover, they clandestinely use tefillin, ẓiẓit, and mezuzot, and pray in almost the same manner as the Jews; namely, in private houses of prayer, with covered heads, reciting their prayers from Jewish prayer-books with Russian translation. The cantor reads the prayer aloud and the congregants then pray silently; during prayers a solemn silence is observed throughout the house. On Saturdays readings are made from the Torah also. Of all the Jewish rites and traditions the Subbotniki observe the Sabbath most zealously, whence their name. They are careful on that day to avoid work altogether; and they endeavor not to discuss worldly affairs. According to the testimony, private and official, of all those who have studied their mode of life, the Subbotniki are remarkably industrious; they read and write; they are very hospitable; and are strangers to drunkenness, poverty, and prostitution. Up to 1820 the Subbotniki lived for the most part in the governments of Voronej, Orel, Moscow, Tula, and Saratof. After that year the government deported those who openly acknowledged their membership in this sect to the foothills of the Caucasus, to Transcaucasia, and to the governments of Irkutsk, Tobolsk, and Yeniseisk, in Siberia. In the reign of Alexander I., owing to that czar's personal tolerance, the Subbotniki enjoyed more freedom. Nevertheless the Russian clergy killed in Moghilef (Mohilev) about 100 Subbotniki and their spiritual leaders, including the ex-archbishop Romantzov, while the latter's young son was tortured with red-hot irons before being burned at the stake. The Subbotniki, however, succeeded in gaining a measure of peace by means of an agreement which they made with the Greek-Orthodox popes. In order that the latter might not be the losers from a material standpoint by the defection of the Subbotniki from their congregations, the members of the sect undertook to pay them the usual fee of two rubles for every birth and three rubles for every marriage. The czar then permitted the Subbotniki to profess their faith openly, but on the condition that they should not engage Jewish preachers and should not themselves proselytize among the Christians. These stipulations were not, however, fully complied with. In the reign of Nicholas I. a feeling of unrest became apparent among the Subbotniki. Many of them wished to embrace Judaism; and some of their number were sent into the Pale of Settlement in order to become fully acquainted with the Jewish religion. On learning of this the Russian government sent among the Subbotniki a number of priests with the view of effecting their return to the Greek-Orthodox fold. But the religious disputations and the persuasion of the priests did not meet with success. The government then decided to suppress the Subbotniki by violent measures, and many of them were subjected to cruel treatment by the officials. 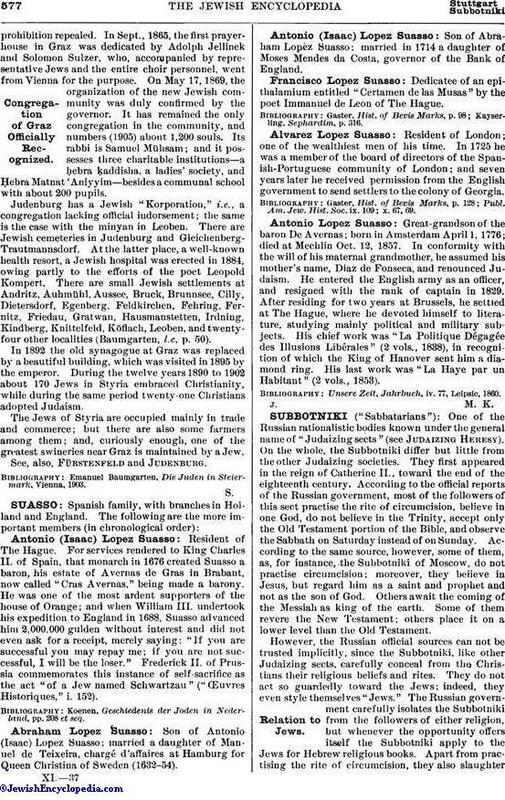 The government then decided (1826) to deport those who had openly professed themselves Subbotniki to the above-mentioned regions in the Caucasus, Transcaucasia, and Siberia, at the same time, but for reasons quite opposite in the two instances, prohibiting the residence in their settlements of Jews and of members of the Greek-Orthodox Church. It is impossible at present to determine the exact number of Subbotniki in Russia, the discrepancy between the government statistics and the actual numbers of this sect being so very wide. The official data represent the membership of the sect as numbering several thousand, while the traveler and writer Dinard, who has been in personal contact with the Subbotniki, states that there are 2,500,000. It may be that Dinard included in his figures all of the Judaizing sects. As regards dress, and mode of life apart from their religious rites, the Subbotniki do not in any way differ from the Greek-Orthodox Russians. Univ. Isr. 1854, p. 396.